A conservation greenway is focused specifically on conservation of the local environment. All greenways seek to promote conservation, however a conservation greenway specifically serves this purpose, and does not allow for recreational activities. Conservation efforts can include managing stormwater, improving air quality, and ecological preservation. A passive greenway can include trails for biking and walking, with overlooks and access to historic or cultural assets. Most of Pittsburgh’s greenways are enabled for passive use. An active site allows for activities which require more permanent infrastructure or special equipment, such as skiing, horseback riding and mountain biking. 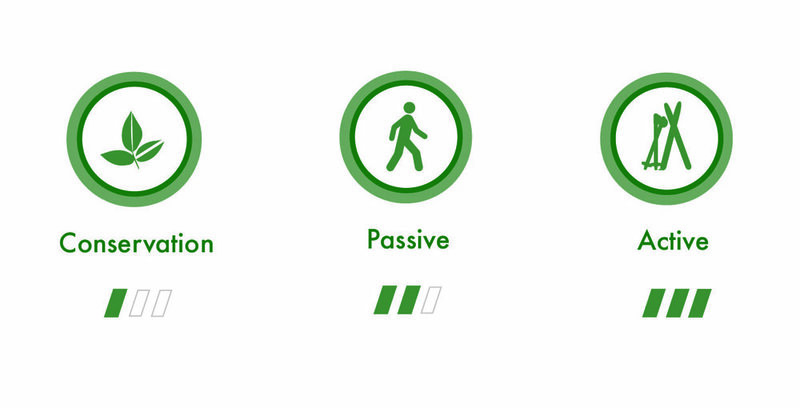 Active sites can make up part of a larger greenway, with other areas enabled for passive use. The Seldom Seen Greenway is located in Beechview, and is an example of a passive greenway. Visitors can enjoy trails and even venture along the train tracks to see the graffitied underside of the city. The main entrance to the greenway is also a local historic landmark, a brick archway providing a tunnel into a changed landscape. Seldom Seen is one of the more active greenways in Pittsburgh for both recreational and restoration-based activities. In November, volunteers planted native tree species along Saw Mill Run to help control erosion and improve water quality. Pretty Up Beechview, a local community group, has also received funding for a Grounded Strategies technical assistance grant, providing them with the resources to clean entryways, clear trails and remove invasive species. The Hazelwood Greenway is one of the original greenways of Pittsburgh. It is less active than Seldom Seen, and maintenance of the greenway is focused more on conservation as it features prevalent invasive species, building detritus and other debris. The greenway is prominently placed to develop stewardship and reconnect with surrounding neighborhoods, with overlooks to downtown and potential to connect with other local trails. Every community has ecological spaces worth care and attention. Different environments provide unique opportunities, for example Toronto has envisioned a plan to support its extensive network of natural ravines, bolstering biodiversity and providing access to neglected areas. In Pittsburgh, stewards volunteer and are able to monitor the health of the greenway. Responsibilities vary depending on the type of greenway, but include monitoring, maintenance, and potential management. Volunteer at one of Pittsburgh's Greenways, or learn more about the program here. Lucia Shuff-Heck is an undergraduate architecture student at the University of Virginia and Communications Coordinator at Biophilic Cities. Becca Halter is a Student Conservation Association Sustainability Fellow with the Pittsburgh Department of City Planning.